Hotel Porin, a large socialist style hotel on the outskirts of Zagreb, serves as a reception centre for asylum seekers. It’s a large concrete building surrounded by a park. This time of the year it’s covered in snow. The hotel is currently at full capacity, hosting more than 600 people. Some ‘guests’ are stranded there as a consequence of the EU and Turkey agreement to close all borders on the South eastern European refugee route. Some have arrived through the EU relocation scheme. Others have been returned from Austria. Living conditions are adequate. People live in separate rooms and there are common spaces where they can socialise or participate in trainings and other leisure activities. Caritas Croatia and Jesuit Refugee Service (JRS) are two of the few organisations still present in Porin. They’re working together to support asylum seekers and increase their chances to integrate in Croatia. The Dublin Convention establishes a country’s responsibility for the examination of the asylum application, or through the relocation scheme. “If we think that among them there are also very vulnerable people such as illiterate single mothers, this is almost impossible without adequate support. It is difficult, but there are solutions. We can simply not allow these people to live on the margins of our society,” said Dražen. Once people are granted asylum status, the government provides for their accommodation for two years, after which they stop receiving support. In those two years they should learn the language, find a job and integrate in local society. “Volunteers have been our most precious resource since the beginning of the refugee and migrant crisis,” says Suzana Borko, Caritas Croatia programme manager. “Before, we used to have a small network of volunteers, mostly pensioners. What happened during this crisis has been absolutely incredible. So many school-age boys and girls have come forward willing to help no matter what. They have worked day and night despite school and their other commitments. I have never seen something like this. Their help is vital, without them we cannot keep our activities going”. 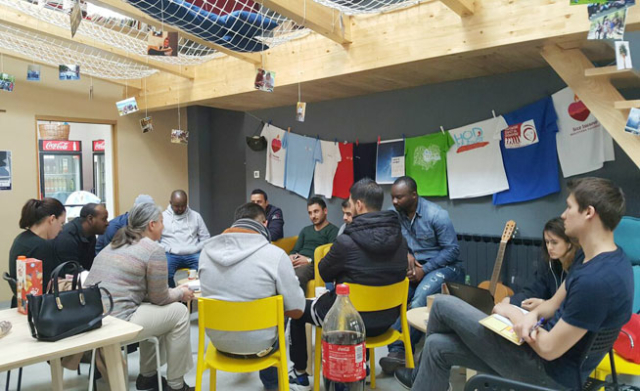 Caritas Croatia and JRS organise language classes for asylum seekers in Porin. “I have been involved in programmes for refugees in the past, but this is the first time that I have the opportunity to have a direct experience. I can’t describe how enriching it is,” said Maja, the volunteer in charge of Croatian lessons. “It is definitely challenging. We have mixed levels in the group and also some people who do not speak any English. Identifying volunteers among asylum seekers themselves has been incredibly helpful to bridge these gaps. Some of them are highly educated and really motivated. We also use images and any kind of non-verbal communication, we have to be really creative. “Their courage gives me strength to overcome any obstacle coming our way. After all they have been through they are still here, ready to learn and to start over”. Another way to help refugees spend their time in Porin in a meaningful way is through the newspaper Paths, a platform created by refugees for refugees where they can share their stories, current experience and hopes for the future. “Paths” also provides critical information on services available and house rules in Porin reception centre. Everything is translated in Croatian, English, Arabic and Farsi to make it accessible to all. People share stories, photos, poems. There are even games and crosswords. Refugees themselves are in charge of the whole process. Caritas just offers them some pointers and guidance to get everything ready for publishing. Paths helps those who write to express themselves and those who read to feel that they are not alone, that many people around them share their same experience,” said Kristina. Said is a refugee from Syria, he has been one of the initiators and main promoters of Paths. “I am an engineer by profession but I have always cultivated my passion for poetry. I’ve won many awards back in Syria,” he said. “Even if challenging, this experience has also been enriching for me. I have travelled, seen new places and found new inspiration.